Rick Canton and guitarist Tim Miller have been collaborating on a new Tim Miller hollowbody electric guitar. 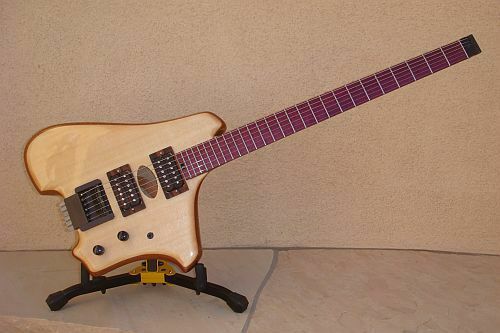 The prototype you see here was built as an extended range instrument to allow Tim to explore the expanded range of an extended scale guitar. Tim’s final guitar will be more “standard” from a scale perspective but its electronics and amplification will be significantly more elaborate. The instrument will include internal mic’ing and piezo elements both inside the body and top of the instrument topped off with a Roland GK3 pick-up – all designed bring out Tim`s studio sound in his live performances. Rick took this opportunity to take a “green” approach to this prototype when he salvaged the neck from the original Equinox build. It had a chip near the back headpiece area but Rick cut it wider and filled it in with epoxy and purple heart dust. Engleman Spruce top – a wood also used for its resonant qualities in piano sounding boards and violins. And finally, here’s a walk around the guitar – something I’d like to see more custom builders provide. Very much digging this, and Tim Miller… what a player! I like the new shape and I’m excited to hear more about the internal mic’ing expected in the final version. Hmm, I’d love to see a pic of someone sitting with it — demonstrating the ergo design with that long neck.. THe video on youtube of Tim playing it sounds awesome! I’m curious about the geometry of the internal chamber. 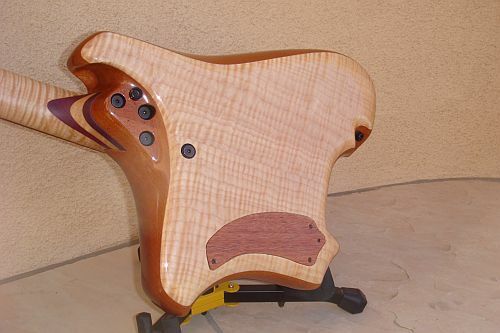 Is the guitar constructed like a clamshell, with wood removed everywhere that it’s not necessary (i.e. to mount pickups etc.)? Also, there may be a typo in the description. 6 lbs 24 oz would of course be 7.5 lbs! Congrats on hooking Tim Miller with this fine instrument. Thank you, I really dig your playing. There is a pic on my Myspace in sitting position. It sits very well with no neck dive at all. The core is a frame, basically, with a separate top and back. The weight is actually 6lbs.- 2.4ozs. Wow! I have never been in love at first site with a guitar before but this has indeed happened! 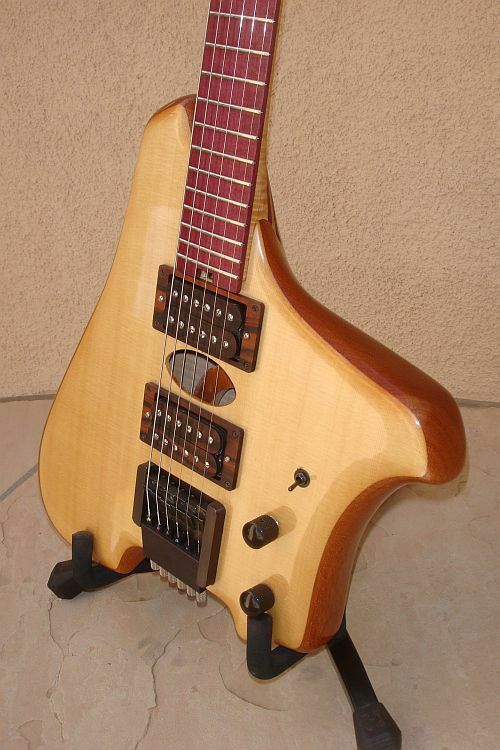 I own over 20 axes but if the price is right enough, I just might ditch them all for this. Keep me posted on status of build, final version, ordering and such.